Scientific Working Group on Dog and Orthogonal Detector Guidlines - a partnership of local, state, federal and international agencies working to establish best practices for use of detection dogs. Funded by the National Institute of Justice, the Federal Bureau of Investigation, and the Transportation Security Administration. See the Approved Guidelines section of the website for training requirements. USDA National Detector Dog Manual - contains guidelines for detector dog training, procedures, and care. Failure of a dog/handler team to implement these national-level guidelines may be a source of cross examination. United States Police Canine Association - contains certification requirements for dogs and handlers. See the 2013 Certification Rules and Regulations which provides tests and standards that dog and handler teams must meet for certification. International Forensic Research Institute/NFSTC Detector Dog Team Certification Program - lists standards that teams must meet and best practices for detector dog teams. 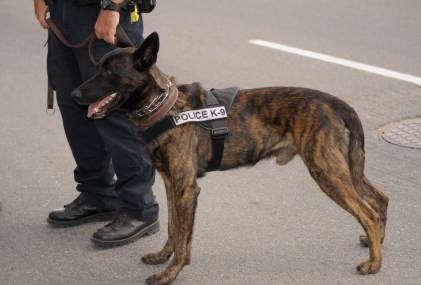 Drug Dogs - Reliability Issues and Case Law - How Good is that Doggie's Nose? - This outline of LeAnn Melton's 2007 Public Defender Conference training addresses case law, discovery requests, and potential areas for cross examination of dog handlers. Drug Detection Dogs: Is this Reliable Evidence? - This training piece contains recommendations about what records to request and areas of cross examination. Contains a transcript of an interview of a dog handler. Canine Detection Evidence - This comprehensive website compiles online publications, research, resources and standards on canine detection evidence. Supreme Court: Alert by a Trained or Certified Drug Dog Normally Provides Probable Cause - This blog post by Jeff Welty of the UNC School of Government explains the U.S. Supreme Court's 2013 holding in Florida v. Harris. Harris holds that when a trained and certified drug dog alerts on a vehicle, that normally provides probable cause to search the car, even if there are no records regarding the dog's performance in the field. However, challenges to drug dog reliability will likely continue because the case holds that defendants are entitled to make such challenges through cross-examining the testifying officer or by introducing his own fact or expert witnesses and that courts will determine the weight given to evidence regarding the adequacy of the dog and handler's training, the team's prior performance in the field, and other factors. Dog Sniffs of People and the Fourth Amendment - This blog post by Shea Denning of the UNC School of Government examines the status of dog sniffs under the Fourth Amendment as it applies to searches of individuals if a dog alerts to the person. Recent news articles - this page contains links to recent press coverage of local and national cases involving detection dogs and is updated regularly. Detector Dogs and Probable Cause - Richard E. Myers II, 14 Geo. Mason L. Rev. 1 (2006) - argues that an alert by even a well-trained dog with an exceptional track record cannot by itself constitute probable cause to search. Includes a statistical analysis of the value of dog alerts and suggestions for improved use of detector dogs. Handler beliefs affect scent detection dog outcomes - Lisa Lit etal, 14:3 Anim Cogn 387(2011) - researchers evaluated eighteen drug and/or explosive detection dog/handler teams to determine how human beliefs affect detector dog outcomes. Motion for Drug Dog Discovery - Sample discovery motion for detection dog records, includes a cite to Florida v. Harris, 113 S. Ct. 1050 (2013). State v. Dail, No. COA 11-384. Defendant's Brief contains caselaw regarding canine sniffs and Fourth Amendment protections. The unpublished opinion issued on 15 Nov 2011 is available here. All standards, protocols, guidelines and training materials utilized by the canine search units involved in the investigation of the case. Contact Sarah Rackley Olson for sample motions and cross examinations on this topic.